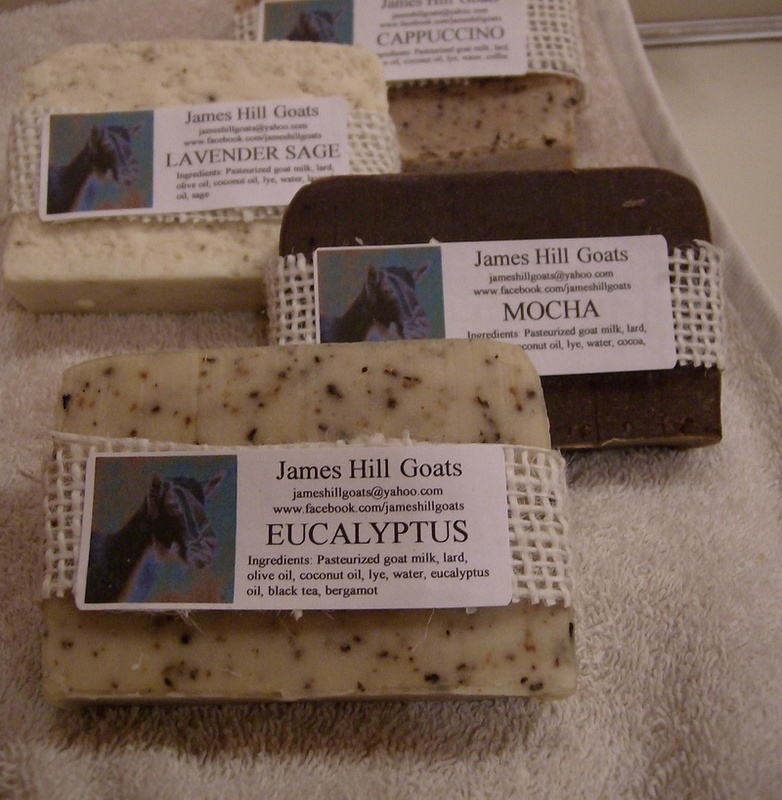 James Hill Goats is happy to announce that our soaps are now available in a retail outlet! We just set up a booth at Serendipity, an upscale resale shop in Jonesboro, Louisiana. 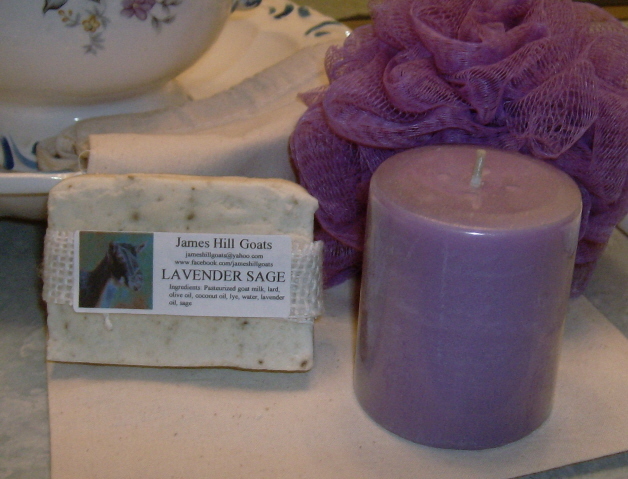 This is an exciting opportunity for us to broaden our market in sales of our handmade goat milk soap. I definitely prefer face-to-face and on-site sales over internet sales. That way, our customers get to experience the wonderful fragrance of our soaps, though most do have beautiful visual appeal. The owner (Jennifer) is very involved in increasing the shop's foot traffic through local advertising and promotions. I hear the vendors are planning some great Black Friday offers! We will be announcing OUR Black Friday promotion on Monday. Be sure to check back! 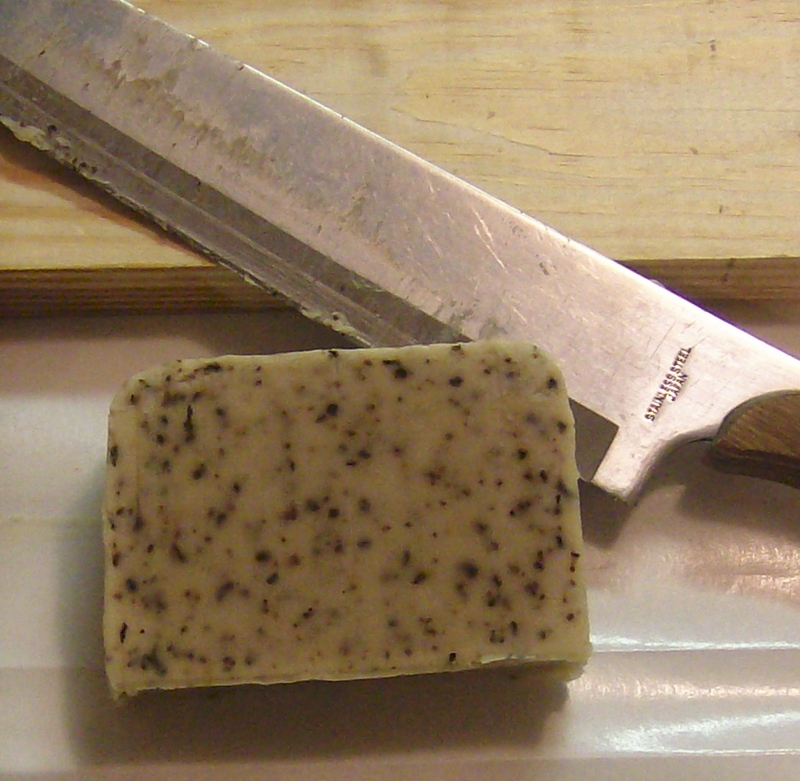 I am very pleased at how our new Gardener's Soap is turning out. This goat milk soap has finely ground pumice to help remove dirt and grime, with lemongrass oil and dried lemon zest for a fresh, clean smell. Three more weeks of curing time, and it'll be ready to use. 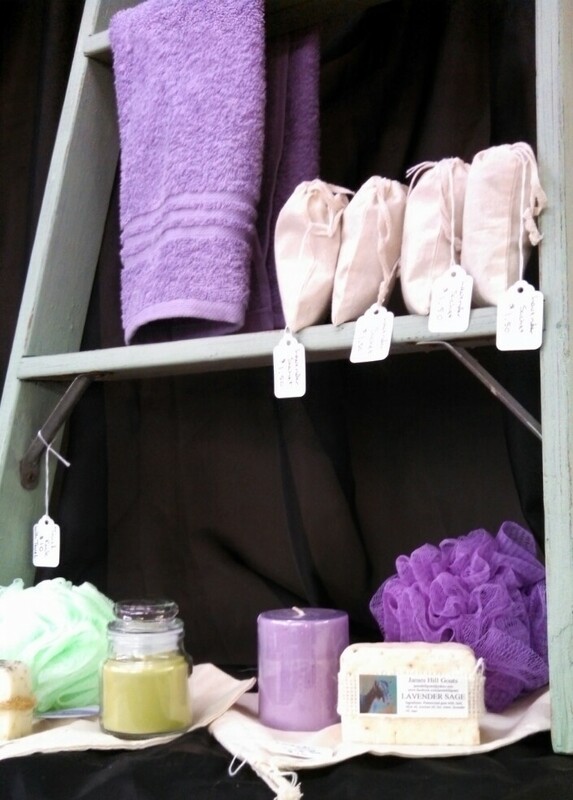 For a unique gift (or to pamper yourself), we now offer handmade goat milk soap bath sets with a matching scent candle and color coordinated bath scrunchy. These sets come packaged in a rustic unbleached cotton drawstring bag. As always, our soaps are made with natural ingredients with no artificial dyes or additives. Several scents are available, including: capucinno, lavender sage, oatmeal cookie and juniper mint. All sets sell for $10 each. Sorry, but we do not yet have our web store online. If you are interested in purchasing, please contact us via e-mail or facebook page. 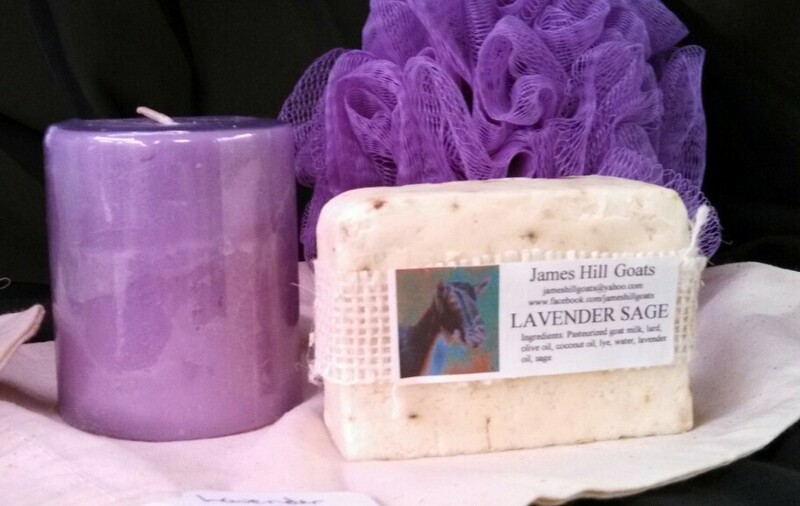 Tomorrow James Hill Goats will be exhibiting our goat milk soap at the Louisiana Art and Folk Festival in Columbia, Louisiana. This will be the first offering of our natural, handmade soaps (though we have participated in the festival before offering jewelry items from our sister company N-Stone Jewelry Design). So this is the soap from the new recipe (thanks for the loan of the book, Laura!). This is eucalyptus with black tea and bergamot, fresh from the mold. The soap is looking good and smelling great! Maybe our first soapmaking procedure going so smoothly was sheer luck, because our second batch was a real trial! 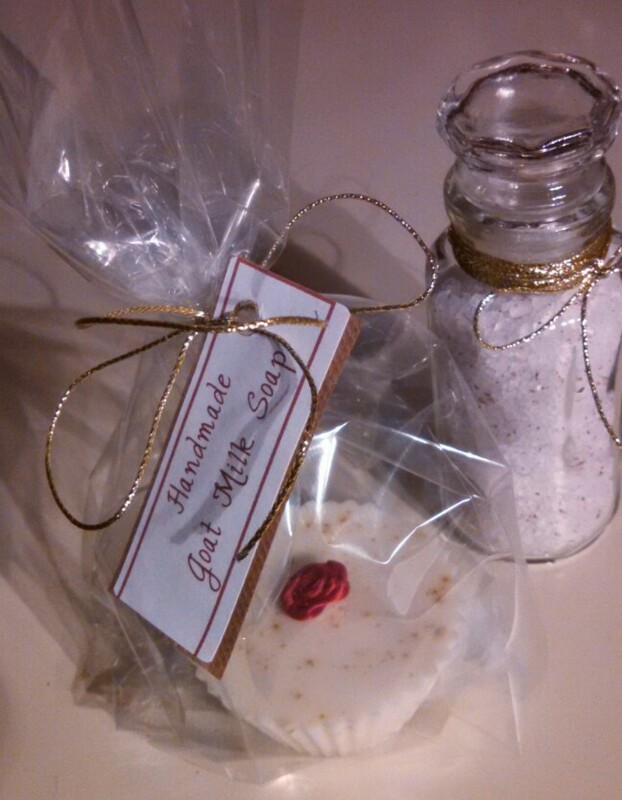 This afternoon we mixed up a basic goat milk soap with dried rose petals and essential oil. We did manage to keep the lye mixture from turning very dark by freezing the milk in larger blocks. It turned more a yellowish color this time, and lightened to a light cream color during blending. But, we had a very difficult time getting the blended mixture to come to trace. A couple of possibilities here: 1) The oil and lye hadn't cooled quite enough before I started blending, 2) It was a bit warm in the house, and the oil and lye mixture wasn't cool enough during blending, or 3) I lost count when I was measuring out the lard, and added an extra cup. Not sure if this batch is going to set very well...will be more able to judge when I check it in the morning. Keeping my fingers crossed! Yesterday we made our first batch of goat milk soap...oatmeal and honey with chamomile. 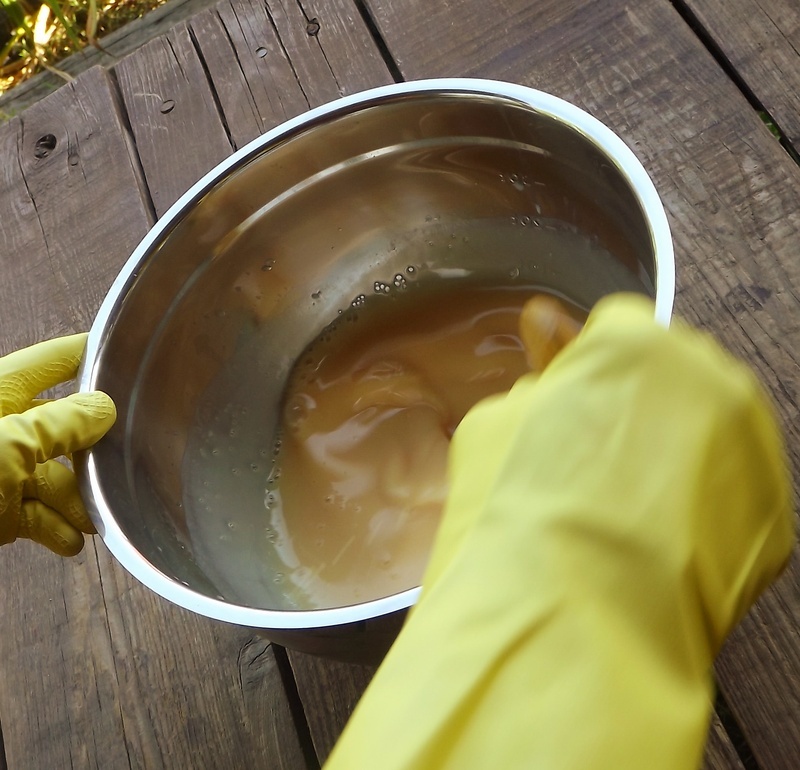 We stirred up the lye mixture outdoors due to the potential for fumes. The lye mixture initially turned very dark orange-brown as it reacted to the sugars in the honey and milk (even though we had frozen the milk in cubes). The mixture came to trace very quickly, and the soap was firming up nicely when I checked on it this morning. 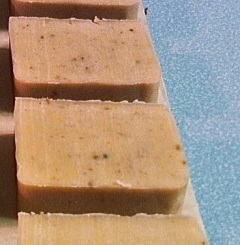 And, the soap had lightened to a medium cream color as it saponified. We will turn it out of the containers and slice it into bars either tomorrow or Monday morning. I think it's going to turn out great!